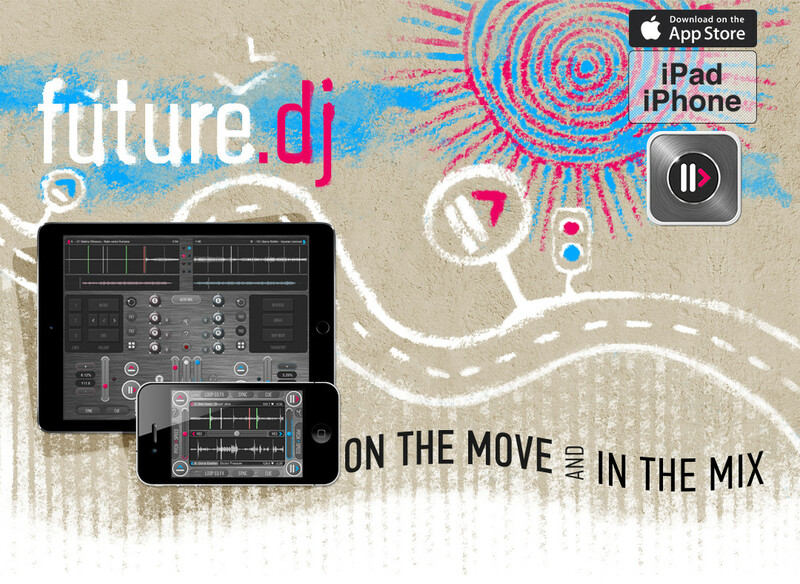 Our DJ mixing app for iPad and iPhone that allows you to mix like a pro dj in no time. This is not a toy, it’s a full-blown software that you can use to mix for an entire party if you want to. Although DJ software on the iPhone and iPad is only at the beginning, Future DJ raises the standards through features such as automatic BPM detection, beat-matching, seamless looping, sampler, XY effects pad and more thus making it a complete professional handheld DJ solution. You can directly access your songs on the device, no need to import anything or use complicated desktop software. Browse your tracks by Artists, Songs, Albums, Genre and more through the iPod library browsing system. Future DJ automatically analyzes a track’s BPM, as well as instantaneously synchronize the beats of two songs at the touch of a button. 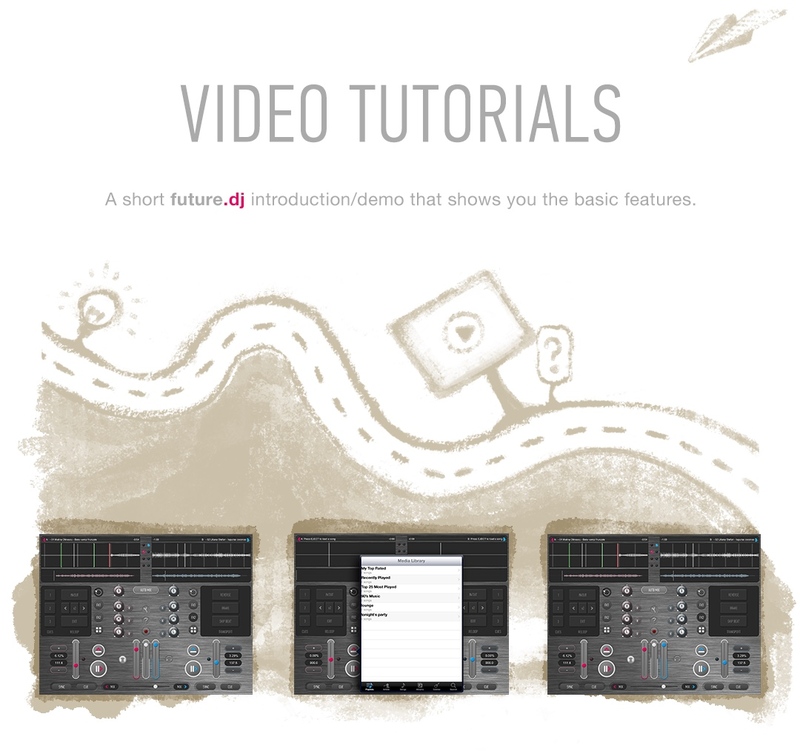 You can make seamless loops, place and trigger hot CUE-points. The classic DJ setup with 2 decks and mixer with pitch/speed control, pitch bend and crossfader offer a complete DJ experience. Record your mixes and share them with your friends and fellow DJs. The song’s speed can be controlled through the pitch slider, thus being able to manually mix by bringing both songs to the same BPM. Truly experience manual mixing by speeding or slowing down tracks with the help of the Pitch Bend buttons. You can also use the automatic Mix feature, which automatically brings the two songs at the same BPM, while at the same time seamlessly moving the crossfader to the other song. Take full advantage of the app’s effects, eqs, filters to achieve a new level of mixing complexity. Tweak the equalizer, use the kill switches, mash-up tracks, use effects to give your mix a unique sound and feel. Trigger (autosyncable) sample pads to complement your mix with new sounds. Like any pro DJ app, this features vinyl simulation including scratch, pitch, reverse-play, brake spin. HOWEVER, Future DJ doesn’t just bring features from the desktop to the mobile iOS platform. We also use the iPhone/iPod to create distinctive features. One of these is MotionPlaying™, a feature that uses the iPhone’s gyroscope to play, pause, scratch, slow down and speed up a track simply through the motion applied to the device. Just drop your iPhone on a turntable and start the party! Like what you’re seeing? Purchase right now!